Whenever tourists return home from Macau, they usually bring with them special Macau food products. What food items can you think of? Portuguese Tarts? Egg rolls? Ginger candy? Crunchy peanut candy? Any others? You must not forget the famous almond cookies! Everyday we see tourists carrying bags of these cookies, bringing them to many places all over the world. Now, let's take a look at this traditional industry! In the 1920s, various traditional bakery shops were established in the market, successfully creating a local specialty of Macau. There were a few big companies, such as Koi Kei Bakery, Choi Heong Yuen Bakery and Yee Kee Bakery, plus many more small shops in the market. The Yee Kee Bakery has the longest history in Macau; it started in 1928 and has lasted for 77 years. The next is Choi Heong Yuen Bakery; it was set up in 1935 and popular for over 70 years. These traditional bakery shops are mainly located along the Rua Almirante Sergio, on the Praia Grande and in the NAPE of Taipa. In the beginning, the shops were just selling simple cakes and cookies with basic flavors. Local people bought them as snacks or gifts for friends and relatives. Gradually, more and more tourists who came to Macau, mainly from Hong Kong at that time, found these pastries were unique and brought them back home as Macau food specialties. 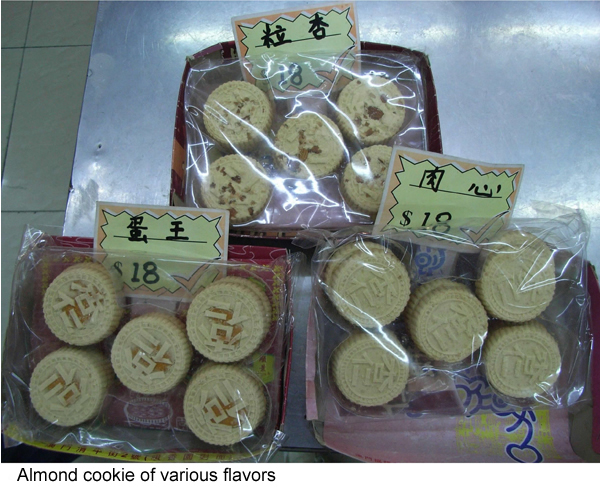 Since then, those cookies became one of the tokens of Macau's special characteristics which tourists can bring home with them. The popularity boosted a keen competition. Many new pastry shops have popped up in the market; currently over 300 different kinds of special food products have been developed. Despite the increasing number of new items, almond cookies are still regarded as the king of the local specialty. Its popularity always stands on the list of the top three gifts; its unique taste and the low price have attracted numerous tourists to become their loyal fans. Ng Lai Ieng, a middle-aged woman and the owner of Tai Lai Bakery for almost 10 years, stated that a pack of almond cookies is sold for only MOP18, and they have not increased the price for about 10 years. Ng, who has run the Tai Lai Bakery which is located at Rua Felicidade for around 10 years, has recognized the development of the traditional pastry, and is going to pass it on to the next generation. "The process of making almond cookies is very simple," she said. To start with, you simply need to prepare flour, lard, sugar, and almonds; mix all the ingredients together according to the appropriate weight, then knead it and fit it into a mold, add almonds inside (if you do not want almonds, you can add other ingredients rather than almonds), pop it out in a vivid shape. Now it can be taken to bake with charcoal. The baking takes around 20 minutes, and the delicious almond cookies are finally done. In Tai Lai, all the steps are done by human hands; tourists can indeed taste the typical Macau famous pastry. The savor of almond cookies has been expanded from one basic taste to now over 12 different flavors in order to satisfy various tastes of customers. There are often staff standing in front of the shop offering a small slice of different products; tourists are welcome to have a taste before they decide to buy it or not. Although this traditional industry is still flourishing, there is a danger looming ahead. The shortage of labor is always a critical problem, because bakery shops cannot offer good conditions and benefits comparable to other companies. Many youngsters prefer to work in casinos rather than learning this kind of manual skill. Ng has to hire imported workers from the mainland to help in her shop. This implies that perhaps no one will inherit her business. Now, not only local people are engaged in the tradition pastry industry, but also those from mainland China. This industry is still booming and there is a hope that the business can be carried on for a long time. Years from now, we will expect to see tourists in the harbor and the airport still carrying bags of almond cookies to all over the world, and with them they are bring home a legend of our city.